It had been six months since I lost my two Black Labradors, (“my girls”), and I was quite content being alone with my only Greyhound — my big, bad boy, Hershey Bar. He is quite a handful and I just wasn’t ready for another Greyhound. I had also just been promoted at work and had a really demanding job. Plus, we were starting up Adoption Days in the spring where we live in South Jersey and we were really busy planning our First Annual Greyhound Picnic. In other words, I did not want another Greyhound — uh-uh, no way, no how! One day I brought Hershey to the kennel for his shots, so I was forced to walk through there. Keeping my eyes straight ahead, I trudged through and almost made it through when, WHAM! there I was, looking into the biggest, brownest, saddest eyes belonging to the most forlorn little face I had every seen. They reeled me right in! I noticed the date of arrival on the crate. It was two months earlier. Why was he still there? Okay, so I disobeyed my own orders. I spent that night tossing and turning, drowning in those eyes. The phone calls were inevitable. First, I called Sue, my Greyhounds Anonymous person, who could always be counted on to render the sanest opinion. I call her my voice of reason. She was, as ever, a big help. Her solution was to offer to drive up with me to pick him up! No help there…. The call to NGAP was worse. I was told he had come from Florida having severe epileptic seizures, several each day, despite increasing doses of Phenobarbital. Our veterinarians felt it was just a matter of regulating his dosage, adjusting his medications, and moving him out of a stressful situation into a stable, secure environment. This all translated into a home. Because I’m a pharmacist and my Hershey is also an epileptic who has been on Phenobarbital for nearly two years, I felt qualified to provide that home. Seizures don’t scare me, although you never get used to them because they come with no warning. I am also well aware of the importance of adhering to a strict schedule when it comes to medication. Our director, David Wolf, has always said there’s a home for every Greyhound and I also believe that. But I’m sure Reeses (actually Reese’s Peanut Butter Pup) would have had a tough time finding someone willing to put up with the “shake, rattle and roll” and the dosing schedule. But for anyone considering a hard-to-adopt dog, please don’t be scared to take on the challenge. I can’t begin to tell you how rewarding it’s been! We increased his Phenobarbital to 120 mg twice a day, added Potassium Bromide drops twice a day, and after a T-4 test, added Soloxine to the regimen. The incidence of seizures decreased from two to three times a week (sometimes as many as two a day), down to a mild spell every few weeks. At one point he went five months without a major incident. To those of you who still have only one Greyhound, I say “go for it!” We all want the perfect dog, the perfect child, the perfect life, but sometimes it just doesn’t work out that way. I haven’t regretted my decision for even one moment, but no, I don’t want a third Greyhound; I will not walk through the kennel, uh-uh, not me, no way, no how! As for me, I’m staying away from the kennel; no more, uh-uh, not me, no way, no how. Note: an excellent website on canine epilepsy is here. 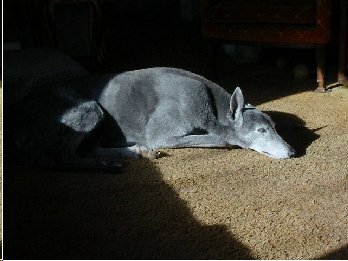 Webmistress’s note: Merci passed away in May 2010. Our sympathies to all who knew and loved her.